Having your own Personal Pitcher gives you all the great hitting practice you need to be the great hitter you want to be in baseball and fastpitch softball. Choosing it with the options I have personally chosen makes it the best pitching machine, toss machine, eye / hand coordination trainer on the market. It's a device that pitches golf ball sized whiffle balls. The theory behind it is that if you can hit a 3" golfball you can certainly hit a 9" baseball and for sure hit a 12" softball. Throw in using a broom stick handle or Easton's Thunderstick as your bat (something that's only 1" in diameter) and you have the ultimate challenge. In fact, the folks who make the Personal Pitcher have designed what they call the Gro-Bat that is made to the exact length and weight of your real bat, but it too is only 1" in diameter and they've put a foam sleeve right where the sweet spot should be. It's like having your own pitching machine in your own backyard (or basement or garage) for a lot less money, it's much safer and it forces you to concentrate even more. It now holds 100 balls at a time, so it doesn't need a second person to feed the balls and comes with both an electrical cord and a rechargeble battery, so you could take it to the field with your team. 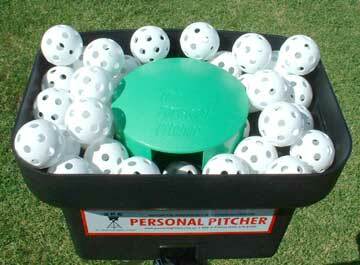 The Personal Pitcher throws fastballs, curves and it even has a setting for soft toss. I invited Kim Maher, the #4 batter of the gold medal winning 1996 Olympic team, over to the house to test out this machine and as good a batter as she is, she hit only half of them on her first attempt. That's how focused you have to be. Obviously, she got timed to it and started pounding the balls. I also sold one to my cousin's son when he was 14. He wasn't a special player then, but he kept using the machine until now he's 18 and playing for his college team. My own 9 year old just started using one and I have an advanced 7 year old student that can hit with it (but I wouldn't go lower that that, because it can be very frustrating if the kid doesn't have good mechanics). Albert Pujols uses his Personal Pitcher in his own back yard. Other major leaguers even take it on the road and use it in their large hotel rooms. The owner of the Personal Pitcher designed it in 1993 for his 14 year old son in hopes of making his JV team and now his son has gone to college on a baseball scholarship, played through the minor leagues and is in his 3rd year of the major leagues. The Personal Pitcher comes in 2 versions, and has all other kinds of options and other gadgets that they sell. But, I only have one version that I recommend and you can't find it cheaper anywhere else on the web. I recommend the Pro unit because it lasts twice as long, throws more consistently and has 3 speeds (simulating speeds from 40 - 90 mph) as well as curve balls. 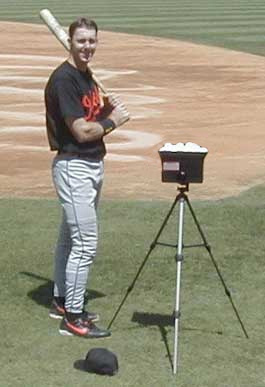 My recommendation includes the Grobat to really get the maximum out of this combination pitching machine & training tool. Buy Now - I guarantee you won't be disappointed (the only complaints I've ever heard are from people who live in very windy areas and don't have a place to use it indoors). It comes with the Pro unit, the Gro-Bat (in the size and weight of your game bat), a tri-pod to mount it on, and even free batting gloves. I know you'd expect to pay something similar to a full batting machine but it's less than 1/3 the price, only $263 plus $18 S/H. (CA residents add $19.07 tax). Bat Size 34" - 31 oz.32" - 29 oz.34" - 27 oz.32" - 25 oz.30" - 23 oz.34" - 24 oz.32" - 22 oz.30" - 20 oz.28" - 18 oz.26" - 16 oz.